Chuck Morgan started his Orlando appliance business in 1948 with one used refrigerator, bought just as his first daughter was born, with money that was supposed to pay her hospital bill. After he sold the fridge, he brought his baby home. "We joked they were going to name me Amana, because that's the brand they carried at the time," said Morgan's daughter, who made it home from the hospital just fine. Becky Harmon of Jacksonville said her father was known for his silly humor and his generosity. He quietly slipped help to family members who needed it through the years. "He was the go-to person, the godfather who helped everyone," Harmon said. Born in North Carolina, Morgan served as a radio operator and a gunner on B-17 bombers during World War II. He flew 50 missions over North Africa and into Germany, said his son, John Morgan, of Orlando. He was honored for saving his crew when their plane got lost over the ocean during a nighttime training mission. "He was very proud of his ability to help keep America free during World War II," his son said. After the war, Morgan met his wife, Eileen, while they were working at the same hotel in Miami Beach. They were married in her hometown of Chicago and moved to Orlando, where they joined a family member who ran an Army-Navy surplus store. 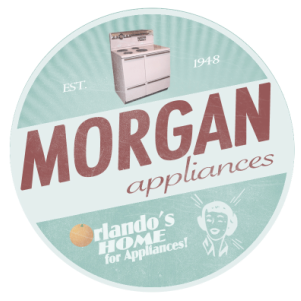 The Morgans opened their appliance shop just as the postwar boom was taking hold. GIs home from the war were getting married, starting families and in need of appliances. Morgan did business on a handshake, taking 50 percent down and the rest on monthly payments without interest. With Morgan's signature humor, the store had a mascot out front: George the mannequin, who spent his life sticking out of a freezer. John Morgan, a humorist who impersonates former President George W. Bush, said his father worked hard but didn't let business get in the way of his other passions: church, family and golf. At Morgan Appliances, he said, "you might get an appliance or you might get a prayer, or you might get both." The store, which is now run by Chuck Morgan's daughter, Janice, supported a host of Morgan family members through the years, including Morgan's brother, Jimmy, who was his chief repairman. Chuck Morgan never officially retired, though he increased his golf outings and decreased his visits to the shop. "It's fair to say he was greatly loved by his customers," John Morgan added. "They come in constantly, even still, and tell stories." Chuck Morgan, whose Morgan Appliances still operates on West Church Street in downtown Orlando, died Sunday of natural causes. He was 92. Chuck Morgan also is survived by his brothers, Frank Morgan of DeLand and Johnny Morgan of Millington, Tenn.; daughter, Mary Ann Morgan-Burke of Winter Park; nine grandchildren; and 13 great-grandchildren.